Tiled throughout, the interior of this upgraded 2 bedroom/2 bath unit is clean and bright with a view that stuns you every time you walk through that front door! The beautiful furnishings and a gorgeous granite & stainless-steel kitchen add to the appeal. 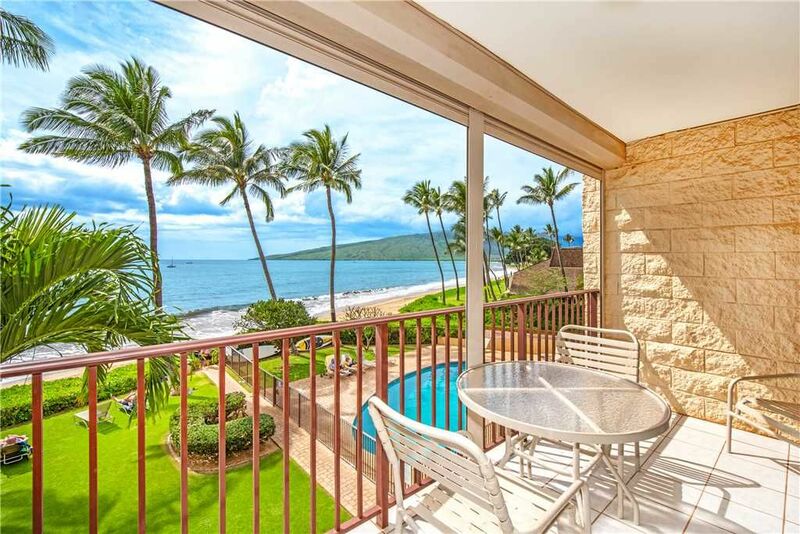 While you prepare a gourmet meal for dining on your large private lanai, you can gaze out at the incredible blue Pacific and forget all your cares. The master bedroom has a king bed & large window with more breathtaking ocean views. The second bedroom has twin beds and its own bathroom, while the living area has a sleeper sofa that makes this unit suitable for up to 6 guests. Flat screen TVs with complimentary cable, WiFi & local phone keep you connected with the outside world; central AC and ceiling fans keep you cool; and an in-unit washer/dryer keeps you clean, conveniently, and ready for anything. Beautiful place. Excellent for a family. There is exterior painting being done on the building so that was a little loud but the unit was not directly affected during our stay. The view from the condo is amazing. The beach that the condo is located on is not big but it was not crowded when we were there so that was not a problem. Across the street is a convenience store, a nice little bakery/ice cream shop. This is a quiet part of the island and does not have a resort feel but that is part of its charm. The one room had a king bed and what would have made it perfect is if the other room had two doubles rather than two twins. Although we did not use the kitchen it was fully equipped. I would recommend this property. Mahalo for your feedback! We sure do love the bakery across the screet. We have taken note on your preference for two double beds instead of twins and may consider this! Please come and see us again. Aloha! This is the second time we've stayed in this condo unit but out third time at this location. It is awesome. It's so beautiful and well kept. We will certainly be back. Mahalo for your feedback. It is a pleasure having you folks back with us. We look forward to your next visit! The location was awesome, beautiful beach and views from condo were great. The condo was well equipped, but could use some updating. The ceiling fans, especially in master bedroom, didn't work efficiently. Also lanai furniture could be improved. The property was very clean, as was the entire beach which was miles long in both direction, great for walking. The only downside to our stay was the noise from the outside painting of the building which we were not informed about. We would probably return. Aloha and mahalo for your review. Notices for the painting have been up on all websites. We apologize for any misunderstanding. Our lanai furniture and ceiling fans are being addressed. We hope that you will visit us again and see the new paint job! I only wished we could have stayed longer! It was a beautiful clean 2 bedroom condo right on Sugar Beach. We walked the beach every day and swam in the surf as the sand extends for quite a ways into the ocean. The condo had everything you needed from kitchen cooking utensils to beach toys and info to explore the local area. We added to the collection with a snorkel set although the reefs are quite a ways down the beach. When the condo management decided to paint the exterior and it meant out balcony was covered up and unusable for the last 2 days, Daniel at Destination Maui helped us out. Great service and very nice people. Definitely a place to stay again. Mahalo for choosing to stay with us for your vacation! Both the beach and the condo are lovely and we're happy you enjoyed them. Aloha!